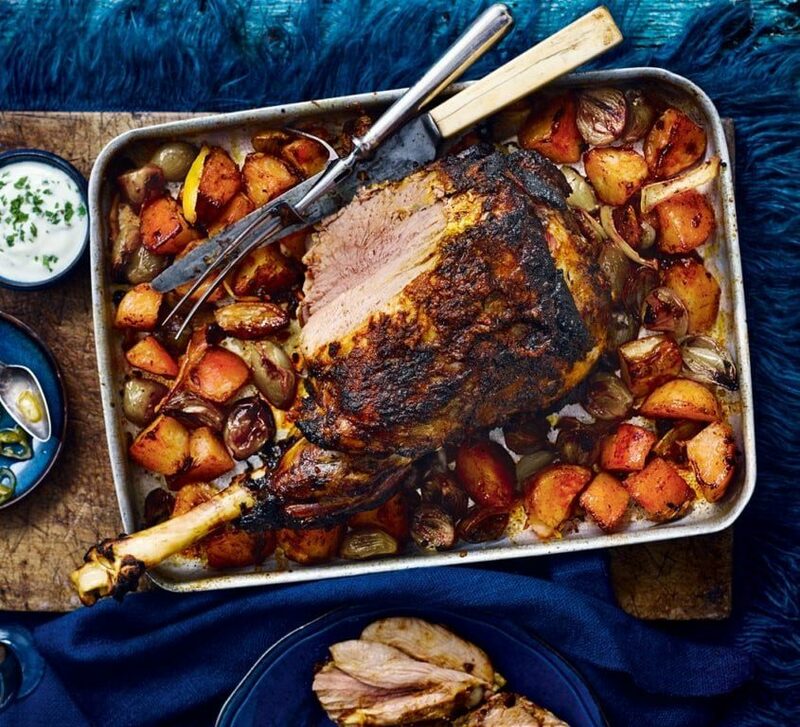 Spice up your life this November and try this leg of lamb cooked packed full of aromatic spices and cooked over the potatoes. Your potatoes will be full of flavour as they catch the juices from the meat. This recipe is long but worth the wait and is guaranteed to pack an explosion of taste to the senses. Tips before you start: You’ll need to start this recipe the day before. You can marinate the lamb for up to 48 hours before cooking. To make the marinade, bash the cardamom in a pestle and mortar to release the seeds, then discard the pods. Add the cumin seeds and pound to a powder, then put in a bowl with the rest of the ground spices. Stir in the tamarind, honey, oil and salt. Bash the fresh ginger and garlic in the pestle and mortar to form a rough paste. Stir into the spice mix. Score the lamb in a criss-cross pattern with a sharp knife, then rub the marinade all over, into the cuts. Put on a plate or tray, cover tightly with cling film and chill overnight. For the quick-pickled chillies, put the cider vinegar and sugar in a medium pan with 60ml water and a pinch of salt. Stir over a low heat until the sugar dissolves. Put the chillies in a medium bowl or container, pour over the pickling liquid and leave to cool. Cover and chill until needed (bring to room temperature to serve). Take the lamb out of the fridge 2-3 hours before you want to cook it. Heat the oven to 220°C/200°C fan/ gas 7. Parboil the potatoes for 5 minutes. Drain, shake to rough up, then put in a very large roasting tin. Add the shallots, cut-side up. In a small pan, melt the ghee/heat the oil. Add the lemon zest, paprika and a large pinch of salt, then stir well. Pour over the potatoes and shallots, then stir to coat. Season. Position an oven rack in the top third of the oven, then put the lamb leg, round-side up, directly onto it. Put the roasting tin of potatoes in the lower third of the oven, beneath the lamb, to catch the meat juices. Roast the lamb and potatoes for 15-20 minutes, then reduce the heat to 200°C/180°C fan/gas 6 and roast for another 30 minutes for pink (add another 10 minutes for medium). A digital thermometer pushed into the thickest part of the meat should read 55°C for pink (60°C for medium). Take out the lamb and rest it on a lipped board for 15-30 minutes. Turn the oven to low to keep the potatoes hot; if they start to become too brown, turn the oven off. When ready to serve, squeeze the lemon juice into the roasting tin (see tip) and shuffle the potatoes to partly coat. Sit the lamb on top. Stir the chopped herbs through the yoghurt and serve with the pickled chillies. Tip: Squeeze the lemon juice into the tin (step 10) rather than over the potatoes, so they keep some crunch.